I've lived in a bunch of different states and at one time or another have crossed the country by car, plane, train, motorcycle, 18-wheeler, and bicycle. Before 1998 I did lots of bicycle tours including a couple in Norway. The most recent was from Camano Island to Boston in 1997. I always wanted to be a long-haul truck driver but didn't finally pursue it until 1994. I really like the constant travel, being in one place one day, another the next. 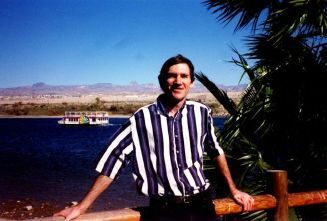 My current residence is in Laughlin, Nevada, about 100 miles south of Las Vegas. I enjoy playing poker, bowling, bicycling, and building websites like lhs78.org.